Experience bus travel like never before with Go Tour Travels! "there are greater things to be achieved every year, and each and everyone must prepare themselves to be great." 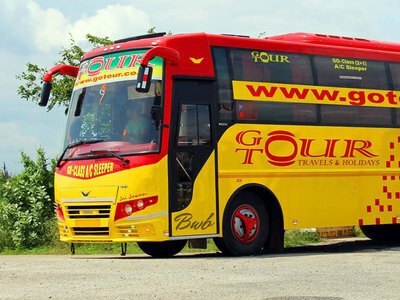 after 4 years journey of making holidays for it customers, go tour travels and holidays is now launching its bus services. Go tour travels and holidays ------------ bangalore hyderabad (bhel) - a/c sleeper (2+1). ------------ bangalore hyderabad (ecil) - a/c sleeper (2+1). Go Tour Travels & Holidays is a renowned brand in the bus operating industry. Our vision is to give a new face to the bus industry. Since our inception passenger comfort was our top priority. We have frequently added luxury buses to our huge fleet of buses. The only thing we focus on is that the comfort quotient of our passengers should never be compromised. We have always tried our best to push our limits in order to develop our travel experience. Read further to understand what we offer that enhances our reputation in the market. We at Go Tour Travels & Holidays strive to maintain the most reasonable rates in the market. This also makes our passengers happy and thus we further give them discount offers on a regular basis to enhance their happiness. Very good service and happy to travel back in GoTour. I was really satisfied with the journey, bus maintenance, and the behaviour of drivers is good and the drop and was also made in time. Very good quality and staff behavior, strongly recommend . Everything is maintained clean and neat, the bus was picked us on time and reached on time. You can also track this bus online which I felt very handy and smart. This is by far the best AC sleeper bus I ever boarded. The excellent service from Go Tours and travels, the maintenance of the bus very well, I have traveled before also in same travels from Hyderabad to Bangalore, I feel very comfortable with this travels, and I recommend to everyone. Overall, because of the staff behaviour and overall crisp hospitality, it was a very good experience and I would like to travel with these guys again. Timely arrival and departure. polite staff and clean seats. Booked ticket for sister and she is very happy that the travels, staff and driver responded her in a good manner and the bus was in time .I heart fully say thanks to the team. They dropped to destination in time .What more can expect from the travelling. Good traveling through go tour and staff were good and care taking for ladies passenger. Best bus and best people as of today. It is really very comfortable to have journey with this service. The journey was good and reached in time with safely and bus staff are respectable with customers .I recommend to be go with this travel service for better and safe to your journey . It was really great, and I appreciate for there timings as I have traveled with many travel agencies but never reached on time . But Go travels has picked me at the boarding point on the right time and dropped me according to the timings given . I would like to prefer Go travels . Bus hygiene was very good and even there pick up and drop to destination was on time. I recommend this bus for all my friends and relatives. Bus is good.Has individual TV on each berth. On time at the boarding and dropping point. Overall it was good journey. Traveled from Bangalore to Hyderabad it was nice journey and very clean inside the bus. Service was great. What I liked about the service of Go Tour is that it is sharing bus tracking also. Its cool feature, as we don't need to ask the conductor about the arrival of bus and all that. And also one suggestion, please detail the boarding point more detailed as where exactly the bus will stop, like a landmark which is very close. Because sometimes the boarding point shown is not clear and incorrect. So I had to call up the concerned person to reach the right location. It's nice journey with Go tour travels. Very nice journey. I am a frequent traveler in Go tour from past 1 year and they are upgrading their buses very well. Keep going. The bus is very nice. I liked the cleanliness and the way the bus is maintained. Would be good if there is some bathroom facility too. A small dinner break for most of the buses would be recommended as the traffic in Bangalore is pretty and and reaching the bus is like a knife on the neck. Bus was late by 10mins, but the quality of the bus was good. Staff called 5mins before reaching the bus stop was a plus point too. Good value for money option in Bangalore -Hyderabad route. It was a nice experience. Sleeper bed is wide. Height is also better compared to many other services. Pickup and drop are on time .Very good to see they are maintaining punctuality. Nice bus, excellent driving and promptly on time. Staff is helpful and the travel was very comfortable. Book round trip and get '12%' discount per seat (UPTO ₹100.0) for minimum 1 seat. Book 4 seats and get '11%' discount per seat. ENJOY THE OFFBEAT EXPERIENCE ! !